Cheyenne, Wyoming – The Wyoming Women’s Legislative Caucus (WyoWLC) announced that former Maine Senator Olympia Snowe will deliver the keynote address at the 10th Annual Leap into Leadership (L2L) February 27th & 28th, 2017 in Cheyenne. L2L will be held February 27th & 28th at the Little America Hotel in Cheyenne. The program will feature workshops, seminars and panel discussions on bolstering female leadership across Wyoming. Senator Snowe will deliver the keynote speech at the Legislative Dinner on February 27th. 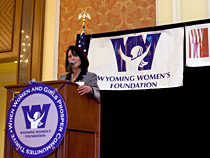 The full L2L agenda will be released in early January and made available at www.wyowlc.org. Senator Snowe is the first woman in U.S. history to serve in both chambers of a state legislature and both chambers of Congress. She was the first Greek American woman to serve in Congress and the youngest Republican woman elected to the U.S. House. Senator Snowe made the decision not to seek a fourth term in the U.S. Senate in order to take her fight for bipartisanship in a different direction. She authored the book Fighting For Common Ground: How We Can Fix the Stalemate In Congress and now serves as a Senior Fellow at the Bipartisan Policy Center where she harnesses her insider’s knowledge to promote civility and change from outside of Congress. 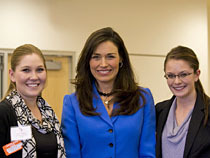 To register for the dinner or the full L2L program, please visit http://wyowlc.org/leap-into-leadership/register/. The cost for attending the entire program is $60 if registered before January 31st, or $75 if registered after the 31st. Cost for the dinner and reception is only $40. Scholarship opportunities are available. Please contact Jessica Jaubert at 307-203-6288 orinfo@wyowlc.org for details. The Wyoming Women’s Legislative Caucus, sponsored by The Equipoise Fund, is a non-partisan organization that advocates for greater participation of women in leadership roles across the state of Wyoming. The Caucus founded and continues to run ‘Leap into Leadership’ programs in communities across the state to inform, educate and engage Wyoming women in leadership roles in both the public and private sector. The Equipoise Fund is a nonprofit, private operating foundation with a mission to energize, enrich and encourage the vision, voice and visibility of the women and girls of Wyoming. 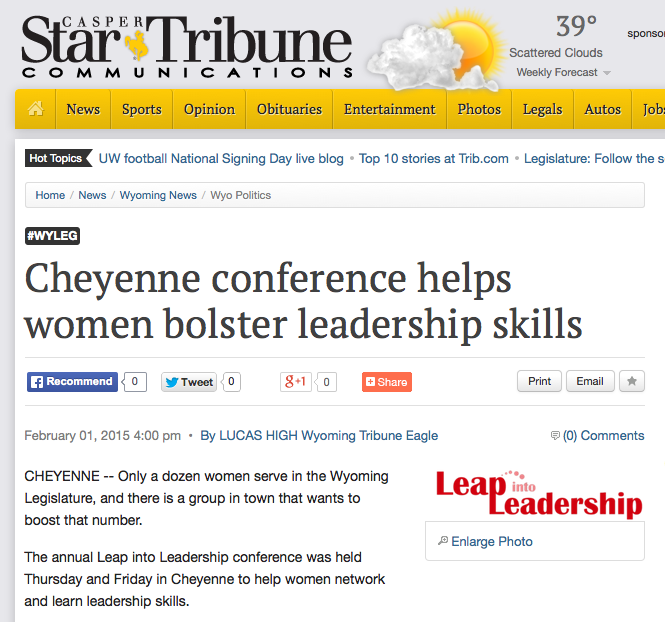 Join us February 25 and 26th in Cheyenne for the ninth annual Leap into Leadership. 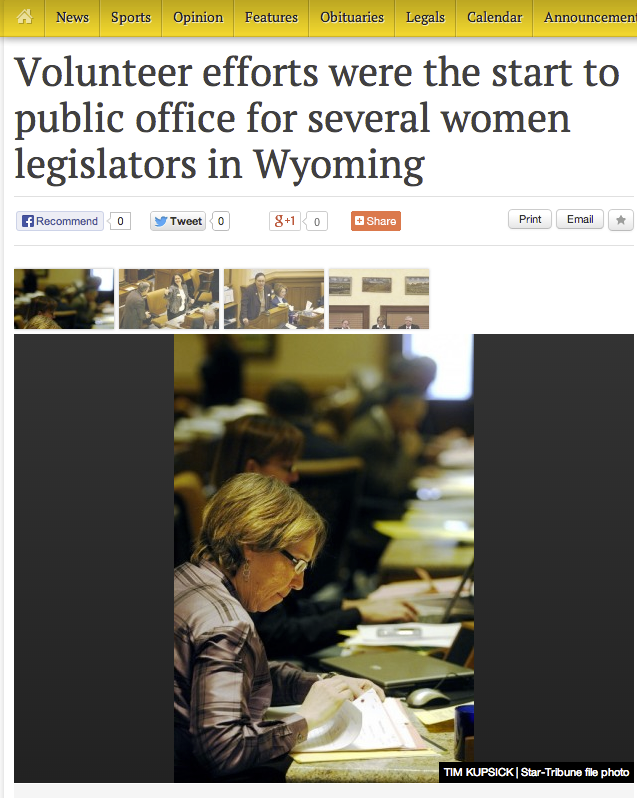 Closing the gender gap in Wyoming’s Legislature. Finding ways to encourage women to run for the Legislature. 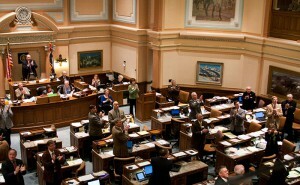 Currently Wyoming ranks 46th in percentage of women in its Legislature. 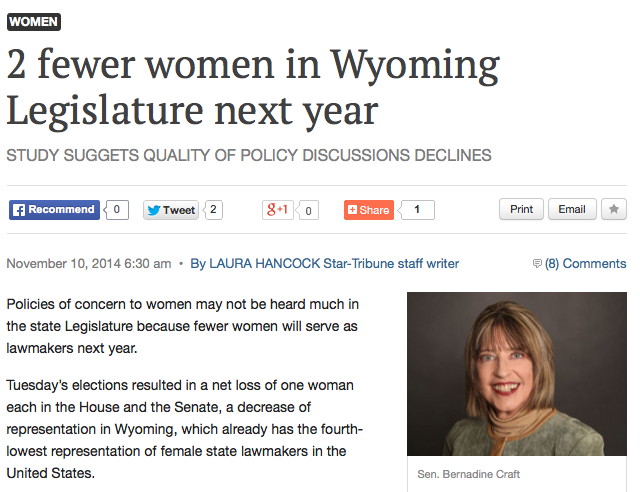 What can we do in both the short and long term to increase the number of women in the Wyoming Legislature? This question was posed by Leadership Wyoming Class of 2016, as part of their Class Project. This portion of the event is free and open to the public, however, if you are not registered for Leap into Leadership, you must register ahead of time by contacting Diana Dennison at ddenison@uwyo.edu. An annual event since 2008, Leap into Leadership offers workshops, networking opportunities and speakers targeted for Wyoming women seeking to cultivate and expand their leadership skills and opportunities. For more information, contact info@wyowlc.org or 307-690-4705. The Wyoming Women’s Legislative Caucus (WyoWLC) is encouraging Wyoming citizens to rally behind Esther Hobart Morris, the first woman to serve as justice of the peace and a pioneer for women’s suffrage, for placement on the new $10 bill. U.S. Treasury Secretary Jack Lew recently announced that a woman will be represented on the new $10 bill and is asking for public input into what female should be on the currency. The WyoWLC is asking Wyoming citizens to show their support for Esther Hobart Morris by signing an online petition at www.estherhobartmorrris.com, and posting on social media with the hashtag #TheNew10. In 1870, Esther Hobart Morris was appointed the nation’s first female justice of the peace in South Pass City, Wyoming. During her tenure, she competently ruled on 26 cases, none of which were ever reversed on appeal. In a time when women across the nation were still denied many rights, Morris broke down barriers proving that a woman could capably hold office. The U.S. Department of Treasury is asking for public input into which woman should be on the $10 bill. They are asking citizens to use the hashtag #TheNew10 on social media to share their ideas, symbols, designs or any other feedback that can inform the Secretary as he considers options for the $10 redesign. For more information the #TheNew10 campaign, visit https://thenew10.treasury.gov. 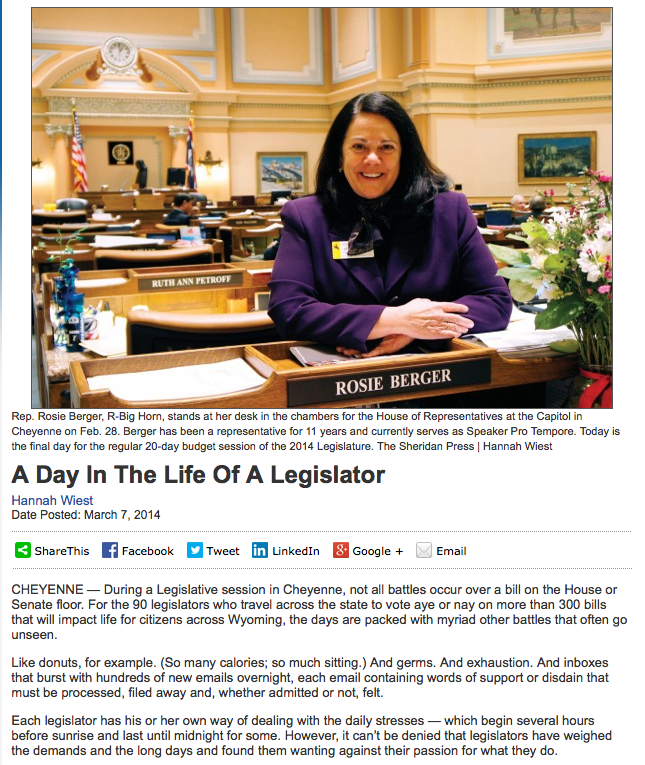 Wyoming Women’s Legislative Caucus Coordinator Melissa Turley will step down on June 30, 2015. Turley has worked with the leaders of the caucus since 2007 to provide support and leadership for women in the Wyoming Legislature as well as aspiring female leaders across the state. Turley’s primary focus has been the planning and production of statewide Leap into Leadership events. Now in its eighth year, Leap into Leadership strengthens civic engagement and leadership in the equality state. Among the more than 1,000 alumnae of local and statewide Leap into Leadership events are the Wyoming State Auditor Cynthia Cloud, Wyoming Superintendent of Education Jillian Balow, a number of legislators, and leaders and elected officials in cities and towns across the state. Turley will begin as the Executive Director of the Teton Village Association in July. Her work will focus on strong administration as well as working to help complete Teton Village as a pedestrian friendly, world-class resort community that retains the character of Wyoming and is the best fit for Teton County. “I am so grateful for the opportunity to advance women’s leadership in Wyoming,” says Turley, who is committed to ensuring a seamless transition. The Wyoming Women’s Legislative Caucus leadership has already retained an interim coordinator on a consulting basis. The nonpartisan Wyoming Women’s Legislative Caucus promotes women in the Wyoming legislature through support and leadership development. The Wyoming Women’s Legislative Caucus is sponsored by The Equipoise Fund. Celinda Lake and Kellyanne Conway, two of the nation’s most noted pollsters framed issues important to women voters and candidates for 250 guests, including Governor and First Lady Mead, legislators and local and statewide elected officials at Leap into Leadership on February 27, 2014. Lake and Conway, co-authors of the book “What Women Really Want,” spoke of changing demographics such as the rise of single mothers, and their impact on elections in America. In addition to these national experts on women in politics, Leap into Leadership also offered leadership workshops, breakfast with State Auditor Cynthia Cloud and a roundtable discussion of women in Wyoming politics to prepare for the 2014 election season. 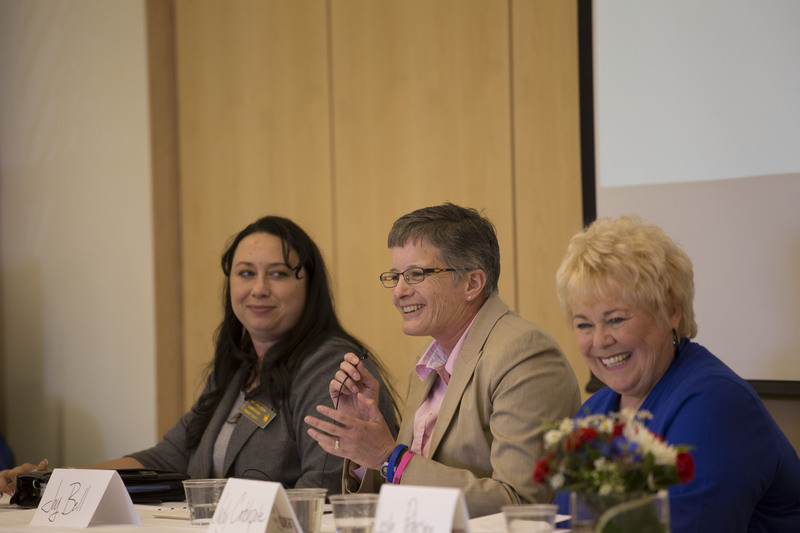 The roundtable discussion featured Leslie Petersen, candidate for Governor of Wyoming in 2010, Fremont County Commissioner Keja Whiteman, Evanston Mayor Joy Bell and former Superintendent of Public Instruction Judy Catchpole. “We never thought we could elect a woman here,” people said to Joy Bell, the first woman elected mayor of Evanston, Wyoming. Bell ran for the position because she thought she could do things better. “It’s the best job I’ve ever had,” she says. 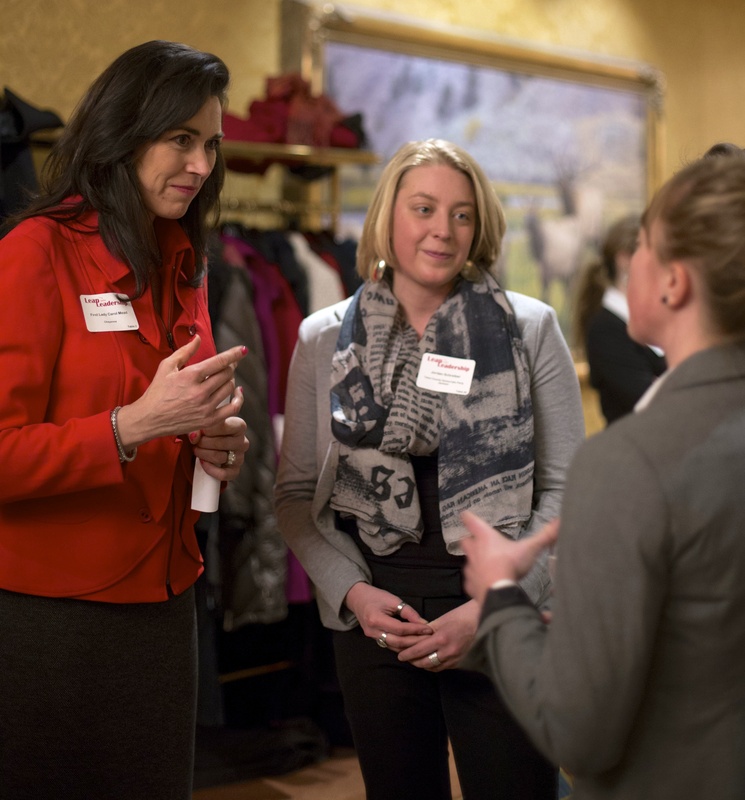 Hosted by the Wyoming Women’s Legislative Caucus, a project of The Equipoise Fund, in partnership with the Wyoming Women’s Foundation, Leap into Leadership aims to increase women’s leadership at all levels. 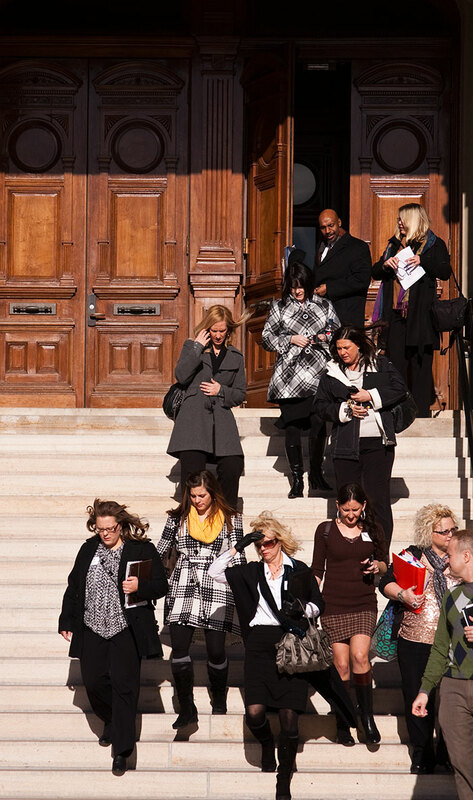 Leap into Leadership alumnae currently serve on Wyoming school boards, city councils, county commissions and in the legislature and State Auditor’s office. Now in it’s sixth year, Leap into Leadership aims to increase women’s leadership at all levels. At least six Leap into Leadership alumni were elected to local or state office in the 2012 elections, part of a 125% increase in the number of women on county commissions and a 15% increase in the number of women in the Wyoming legislature. Leap into Leadership 2013 focused on the theme “We the People” to address core values, civic engagement and ethics with a program including keynote speaker Sofield as well as an ethics workshop from the University of Wyoming College of Business, a simulated congressional hearing by students participating in We the People: The Citizen and the Constitution Program and leadership development workshops. 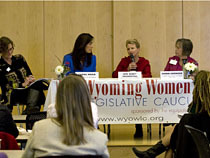 The Wyoming Women’s Legislative Caucus and Wyoming Women’s Foundation will host two Leap into Leadership workshops in May 2013, in Sheridan on May 21, and in Riverton on May 22. Founded in 2006, the bipartisan Wyoming Women’s Legislative Caucus is sponsored by The Equipoise Fund. 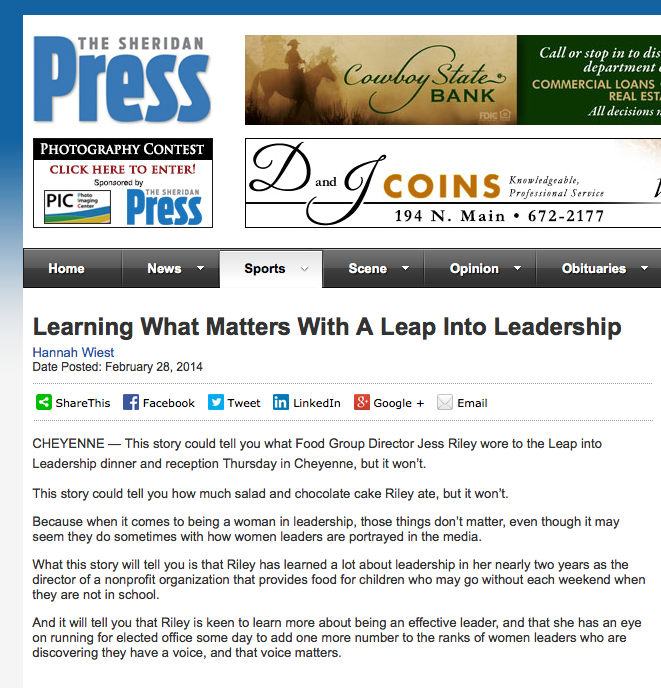 A record number of women attended Leap into Leadership on March 1st and 2nd in Cheyenne, and nearly 20% of attendees surveyed said they plan to run for elected office in 2012. 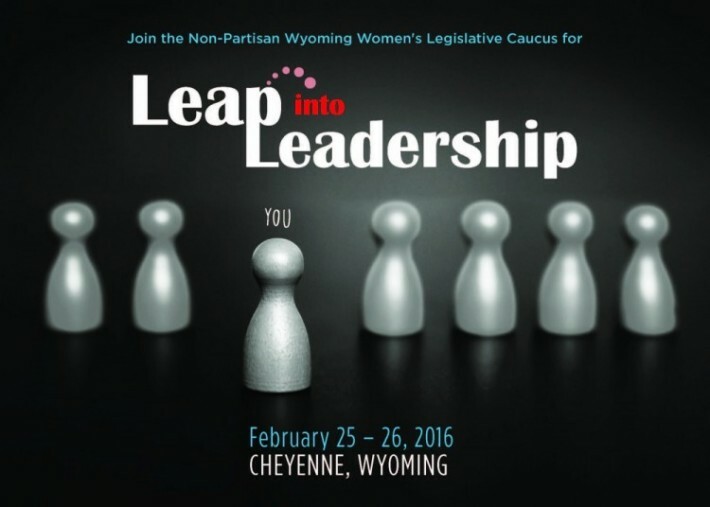 Hosted annually by the bipartisan Wyoming Women’s Legislative Caucus, Leap into Leadership aims to increase women’s leadership at all levels. “We hope to promote a more representative face of government in the equality state,” says Melissa Turley, coordinator of the Wyoming Women’s Legislative Caucus. Women make up less than 15% of the seats in the State Legislature and less than 6% of county commissioners across Wyoming, yet women comprise 49% of the population according to the 2010 census data. And despite the fact that the median age of Wyoming is 37, only 8 of 90 state legislators are under the age of 40. “Leap into Leadership combines training with inspiration and motivation to move women into leadership roles in their communities and our state,” says Rep. Elaine Harvey, R-Lovell, and chairwoman of the Wyoming Women’s Legislative Caucus. Twenty women attended a campaign planning workshop on March 2, which was intended to prepare them for the 2012 filing period from May 17 to June 12. Others participated in workshops focused on social media, community and personal leadership, and messaging. Participants overwhelmingly reported they found these leadership development workshops beneficial: “I learned how to run a campaign and be inspired by women who are very engaged in the process,” wrote one. Leap into Leadership is a two-day event that includes speakers, training and a networking dinner. Keynote speaker Lynda Clarizio, CEO of INVISION, shared her eight principles of leadership with the 250 attendees, at a dinner co-hosted by the Wyoming Women’s Foundation. Clarizio encouraged women to take charge, seek out mentoring and networking opportunities, and inspire others by being true to themselves. She outlined the family-friendly practices that she offers in her company, of who 65% are women, such as flexible hours, video conferencing and part-time schedules. The following morning, State Auditor Cynthia Cloud hosted breakfast in her office in the State Capitol, and Supreme Court Chief Justice Marilyn Kite spoke of the need for both a legislature and judiciary representative of the people. Justice Kite pointed out that while 35% of attorneys in Wyoming are women, just 7% of judges are female, and she called on Wyoming women to wield the collective strength of both genders. “The health of our state depends on you running,” she said. First Lady Carol Mead and former first ladies Nancy Freudenthal and Sherri Geringer spoke about the opportunities and challenges each experienced as first lady of Wyoming as well as the issues important to them, specifically women and children. The program concluded on Friday with a presentation by Wyoming’s lone Congresswoman, Cynthia Lummis, who currently co-chairs the Congressional Caucus for Women’s Issues. Lummis stressed that women are best qualified to discuss women’s issues, and that a representative government should look more like the people they represent. The bipartisan Wyoming Women’s Legislative Caucus and its partners assembled nearly 225 men and women in Cheyenne February 3 & 4, 2011, for speakers, workshops and discussion aimed at increasing the number of women in leadership in the Equality State. On Thursday, February 3, Governor & First Lady Mead attended a reception at Little America co-hosted by the Wyoming Women’s Foundation that featured three women in leadership in the Wyoming House of Representatives: Rep. Elaine Harvey, Rep. Rosie Berger and Rep. Mary Throne. Also in attendance were Secretary of State Max Maxfield, State Auditor Cynthia Cloud, Superintendent of Schools Cindy Hill and over a dozen state senators and representatives. “Be rebellious enough to run,” said Rep. Mary Throne of Cheyenne, the House Minority Whip, drawing on a letter written by Abigail Adams in 1776 to her husband John. 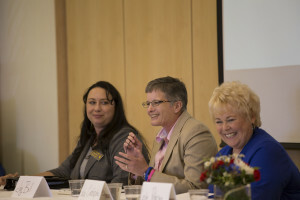 Rep. Throne, Rep. Harvey and Rep. Berger shared stories of their road to the Legislature, ranging from a conscious plan carried out over five years to being asked to run after approaching over 20 men to represent her district in the legislature. Rep. Berger, Chair of the House Appropriations Committee spoke of her experience as a committee chair, and encouraged attendees to get involved and be a leader in every level of their daily lives. On Friday morning, State Auditor Cynthia Cloud, herself a graduate of Leap into Leadership, hosted breakfast in her office in the State Capitol. “We need to work harder to identify women interested in making a difference in their communities and their State,” said Auditor Cloud. Following breakfast, attendees received tips on how to advocate for change and create an effective message in workshops offered by The White House Project, National Conference of State Legislatures and Equality State Policy Center. insurance. Ms. Frey of the Wyoming Children’s Action Alliance concurred that our citizen legislature is not representative of the people of Wyoming; and at the end of the day, participants discussed drafting a bill to pay legislators an annual salary. In closing, President and Co-Chair of the John P. Ellbogen Foundation Mary Garland encouraged participants to get out of their comfort zones, just like she did to participate in the lunch panel, “If you can imagine it, you can achieve it,” she said. Wyoming women prepared to take on greater leadership responsibilities personally, professional and politically in Casper April 22 and 23 at the third annual Leap into Leadership event hosted by the Wyoming Women’s Legislative Caucus. At the event, Wyoming women legislators past and present shared their experience and encouraged others to follow in their footsteps, pointing out that only 15 women currently serve in the state legislature. “If you don’t run, you won’t win for sure,” said Representative Debbie Hammons, “Your becoming involved changes the nature of the debate.” Representative Hammons, asked to speak on barriers for women in leadership encouraged participants not to let fear turn obstacles into barriers. Close to 90 men and women participated in the event, which included leadership development workshops and panelists speaking Friday at lunch about the conference theme, Finding your Voice. This event was hosted in partnership with Equality State Policy Center, National Conference of State Legislatures, The Equipoise Fund, The White House Project, Wyoming Business Alliance, and Wyoming Women’s Foundation; with financial support from BNSF Railways, Brimmer Kunsman Communications, The Equipoise Fund, Larry Wolfe – Holland and Hart, KKW Consulting Inc., Qwest, Wyoming Bankers Association and the Wyoming Council on Women’s Issues. 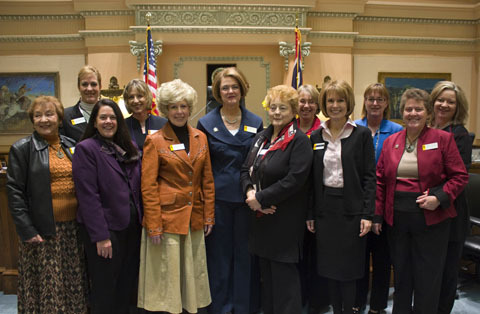 Founded in 2006, the bipartisan Wyoming Women’s Legislative Caucus is a project of The Equipoise Fund. Additional financial support provided by The Equipoise Fund, Larry Wolfe – Holland and Hart, KKW Consulting, Inc., and the Wyoming Bankers Association. The bipartisan Wyoming Women’s Legislative Caucus hosted over 100 women from across the Equality State at the State Capitol on Friday, February 29, 2008, for an event called “Leap into Leadership.” The day included coffee in State Auditor Rita Meyer’s office, leadership development workshops and speeches by Former Representative Clarene Law as well as Wyoming Women’s Legislative Caucus members Rep. Deb Hammons, D-Washakie, and Rep. Rosie Berger, R-Sheridan. Former Representative Law, addressing the Wyoming House of Representatives in honor of Women’s History Month said, “I never thought I’d see unity like this, a Women’s Legislative Caucus, both sides of the aisle.” Representative Law also recognized the Equality State Policy Center and the Wyoming Business Alliance for working together on this event, celebrating the wonderful “partnership of purpose” that brought those two entities together for the sake of women’s leadership. Women in state and local government, non-profits, private industry, and students flocked to the event. The youngest participant missed her 5th grade school day to attend with her mother, as did two high school seniors from Sheridan, and close to thirty undergrad and graduate students from the University of Wyoming attended. Thirty participants enjoyed their first-ever visit to the in-session Wyoming Legislature, and twenty-seven participants from age 18 to 60+ said they were thinking about running for elected office.